Simply defined, arthritis is inflammation of one or more of your joints. In 2011, more than 50 million people in the U.S.A. reported that they had been diagnosed with some form of arthritis. In an arthritis shoulder, inflammation causes pain and stiffness. Osteoarthritis is a condition that destroys the smooth outer covering (joint cartilage) of bone. As the cartilage wears away, it becomes thinned and rough, and the protective space between the bones decreases. The bones of the joint rub against each other (“bone-on-bone”), causing grinding sounds, stiffness and pain. 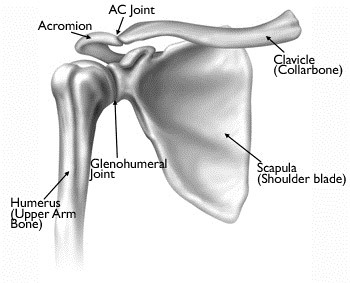 Osteoarthritis usually affects people over 50 years of age and is more common in the acromion-clavicular joint than in the gleno-humeral shoulder joint. 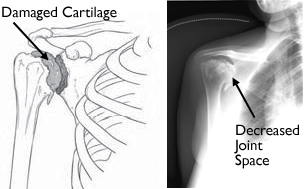 (Left) An illustration of damaged cartilage in the glenohumeral joint. 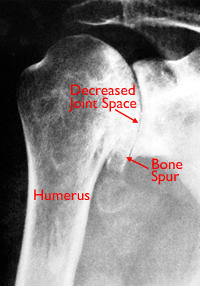 (Right) This x-ray of the shoulder shows osteoarthritis and decreased joint space (arrow). Rheumatoid arthritis (RA) is a chronic disease that attacks multiple joints throughout the body. Rheumatoid arthritis is an autoimmune disease. This means that the immune system attacks its own tissues. In RA, the defences that protect the body from infection instead damage normal tissue (such as cartilage and ligaments) and soften bone.It is symmetrical, meaning that it usually affects the same joint on both sides of the body. The joints of your body are covered with a lining (synovium) that lubricates the joint and makes it easier to move. Rheumatoid arthritis causes the lining to swell, which causes pain and stiffness in the joint. 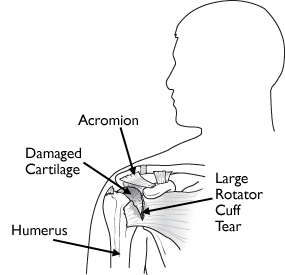 Arthritis can also develop after a large, long-standing rotator cuff tendon tear. The torn rotator cuff can no longer hold the head of the humerus in the glenoid socket, and the humerus can move upward and rub against the acromion. This can damage the surfaces of the bones, causing arthritis to develop.The combination of a large rotator cuff tear and advanced arthritis can lead to severe pain and weakness, and the patient may not be able to lift the arm away from the side. The most common symptom of arthritis of the shoulder. Aggravated by activity and progressively worsens. If the glenohumeral shoulder joint is affected, the pain is centered in the back of the shoulder and may worsen with changes in the weather. Patients complain of an ache deep in the joint. Night pain is common and sleeping may be difficult. Limited range of motion. Limited motion is another common symptom. It may become more difficult to lift your arm to comb your hair or reach up to a shelf. You may hear a grinding, clicking, or snapping sound (crepitus) as you move your shoulder. As the disease progresses, any movement of the shoulder causes pain. To confirm the diagnosis, your doctor may inject a local anaesthetic into the joint. If it temporarily relieves the pain, the diagnosis of arthritis is supported. Rest or change in activities to avoid provoking pain. You may need to change the way you move your arm to do things. Physical therapy exercises may improve the range of motion in your shoulder. Nonsteroidal anti-inflammatory medications (NSAIDs), such as aspirin or ibuprofen, may reduce inflammation and pain. These medications can irritate the stomach lining and cause internal bleeding. They should be taken with food. Consult with your doctor before taking over-the-counter NSAIDs if you have a history of ulcers or are taking blood thinning medication. 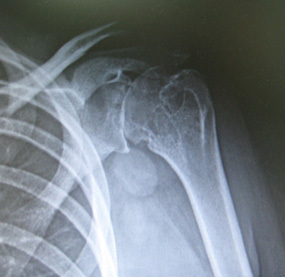 Corticosteroid injections in the shoulder can dramatically reduce the inflammation and pain. However, the effect is often temporary. Ice your shoulder for 20 to 30 minutes two or three times a day to reduce inflammation and ease pain. Dietary supplements, such as Omega fish oils, glucosamine and chondroitin sulfate may help relieve pain. Arthroscopy. Cases of mild glenohumeral arthritis may be treated with arthroscopy. During the procedure, your surgeon can debride (clean out) the inside of the joint. Although the procedure provides pain relief, it will not eliminate the arthritis from the joint. If the arthritis progresses, further, surgery may be needed in the future. Shoulder joint replacement (arthroplasty). Advanced arthritis of the glenohumeral joint can be treated with shoulder replacement surgery, in which the damaged parts of the shoulder are removed and replaced with artificial components, called prosthesis. (Left) A conventional total shoulder replacement (arthroplasty) mimics the normal anatomy of the shoulder. (Right) In a reverse total shoulder replacement, the plastic cup inserts on the humerus, and the metal ball screws into the shoulder socket. Hemiarthroplasty: Just the head of the humerus is replaced by an artificial component. Total shoulder arthroplasty: Both the head of the humerus and the glenoid are replaced. 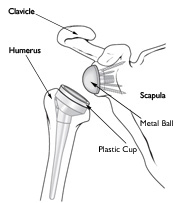 A plastic "cup" is fitted into the glenoid, and a metal "ball" is attached to the top of the humerus. Reverse total shoulder arthroplasty: In a reverse total shoulder replacement, the socket and metal ball are opposite a conventional total shoulder arthroplasty. The metal ball is fixed to the glenoid and the plastic cup is fixed to the upper end of the humerus. A reverse total shoulder replacement works better for people with cuff tear arthropathy because it relies on different muscles, not the rotator cuff, to move the arm. Resection arthroplasty: The most common surgical procedure used to treat arthritis of the acromion-clavicular joint is a resection arthroplasty. Your surgeon may choose to do this arthroscopically.In this procedure, a small amount of bone from the end of the collarbone is removed, leaving a space that gradually fills in with scar tissue. Recovery: Surgical treatment of arthritis of the shoulder is generally very effective in reducing pain and restoring motion. Recovery time and rehabilitation plans depend upon the type of surgery performed. Every year, thousands of conventional total shoulder replacements are successfully done in the United States for patients with shoulder arthritis. This type of surgery, however, is not as beneficial for patients with large rotator cuff tears who have developed a complex type of shoulder arthritis called "Rotator cuff tear arthropathy." For these patients, conventional total shoulder replacement may result in pain and limited motion, and reverse total shoulder replacement may be an option. 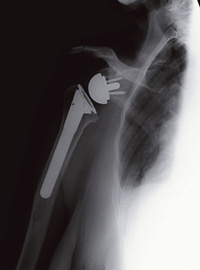 Description: A conventional shoulder replacement device mimics the normal anatomy of the shoulder: a plastic "cup" is fitted into the shoulder socket (glenoid), and a metal "ball" is attached to the top of the upper arm bone (humerus). 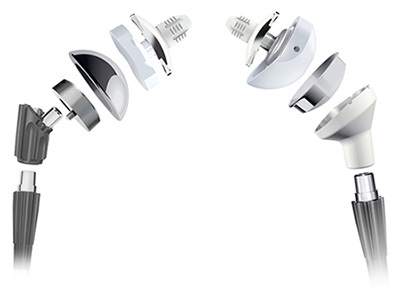 In a reverse total shoulder replacement, the socket and metal ball are switched. The metal ball is fixed to the socket and the plastic cup is fixed to the upper end of the humerus. (Right) The reverse total shoulder replacement allows other muscles — such as the deltoid — to do the work of the damaged rotator cuff tendons. The components of a reverse total shoulder replacement include the metal ball that is screwed into the shoulder socket, and the plastic cup that is secured into the upper arm bone. This procedure to replace your shoulder joint with an artificial device usually takes about 2 hours. Your surgeon will make an incision either on the front or the top of your shoulder. He or she will remove the damaged bone and then position the new components to restore function to your shoulder. A typical follow-up x-ray of a reverse total shoulder replacement. The following information will help you prepare for your shoulder replacement surgery. It is important that you understand and follow the rehabilitation guidelines to give yourself the best chance of recovery from surgery. If you have any concerns or questions at any time, please discuss these with me or your therapist. You will need to visit the hospital for a pre-admission consultation with a nursing sister. She will identify and address any underlying medical problems and assist with the administrative process. You will require a general anaesthetic ± regional block. The operation normally takes between 90-120 minutes. Home Planning: Making simple changes in your home before surgery can make your recovery period easier. For the first several weeks after your surgery, it will be hard to reach high shelves and cupboards. Before your surgery, be sure to go through your home and place any items you may need afterwards on low shelves. When you come home from the hospital, you will need help for a few weeks with some daily tasks like dressing, bathing, cooking, and laundry. If you will not have any support at home immediately after surgery, you may need a short stay in a rehabilitation facility until you become more independent. During this time, you can come out of the sling three times a day to do your physiotherapy exercises. 6 months: Resume full activities including progressive return to sporting activities. If you have access to a heated pool or Hydrotherapy centre, then I strongly recommend that you take advantage of this form of therapy to aid with your rehabilitation. Research is being conducted on shoulder arthritis and its treatment. In many cases, it is not known why some people develop arthritis and others do not. Research is being done to uncover some of the causes of arthritis of the shoulder.